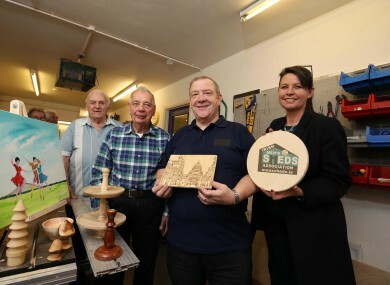 Bill Burrows, Ben Hopkins, Billy McCord and Geraldine Nelson of the North Belfast Men's Shed. LIFE CAN BE tough for men who have worked all their lives after they retire. Having invested all their effort and energy into their jobs, many can find themselves struggling with their identity and what to do when the work life ends. That’s according to Professor Barry Golding of Federation University Australia. Golding told TheJournal.ie that this focus on work is often at the expense of other aspects of a man’s life, and as a person grows older their social circles and relationships can diminish. “It frequently happens then that when they go beyond work they find it very difficult to cope with a changed identity,” he said. When this happens, Golding said that many men older men are not comfortable talking to their families or a professional. They become withdrawn and can get depressed. This can happen to younger men too who find themselves forced into retirement early or given redundancy. He said a culture of not speaking about mental health or how someone feels can lend to this sense of isolation – leaving a person feeling cut off and alone. “It’s not unusual for some men to get depressed and suicidal when this happens,” he said. This is what inspired the founding of the first Men’s Shed in Tongala, Victoria, Australia in 1998. The shed was to be a community place where men could come and talk to one another, spend their time and work on shared projects. It was a huge success and there are currently over 1,000 across Australia. The Irish Men’s Sheds Association (IMSA) was set up in January 2011. There are now 350 shed across communities in Ireland. Men don’t talk face to face, they talk shoulder to shoulder. This is the idea that men would prefer talking to their contemporaries and friends, rather than counsellors or others. According to Barry Golding, who has researched the sheds, the initiative is done well here. “It’s done particularly well here,” said Golding. Golding says that Ireland’s focus on community helped the idea thrive here when it started. “People here don’t wait for the Government to come and save them, if you do that you’ll just go under,” he said. He said he has interviewed people and their families who had participated in the sheds and found their lives had been changed by the initiative. “Some of these men would not get out of bed before. They would not answer the phone or open the curtains. It sounds almost too good to be true but it’s a model that has proved to be hugely successful. A gathering is to be held this Saturday in Belfast with 400 men from Ireland, Northern Ireland, Great Britain and Australia meeting to hear talks around the Men’s Shed movement. CEO of the IMSA, Barry Sheridan, said the primary goal of the charity was to improve the mental health of men in Ireland. “The primary objective of our organisation is to advance the health and well-being of the participating men, through supporting the development and sustainability of Men’s Sheds,” he said. Golding said that social isolation was killing men, and that the movement helped to break that isolation. “Isolation is deadly. Full stop. This breaks social isolation,” he said. It’s men talking to each other and doing things together from a position of equals. To learn more about Men’s Sheds visit the IMSA website. Email “"People here don't wait for the Government to come and save them, if you do that you'll just go under"”. Feedback on “"People here don't wait for the Government to come and save them, if you do that you'll just go under"”.